In my post on deliberate practice from last week, I mentioned I was awaiting delivery of a book on weathering techniques. It arrived last Friday and I had a chance to dig into it over the weekend. 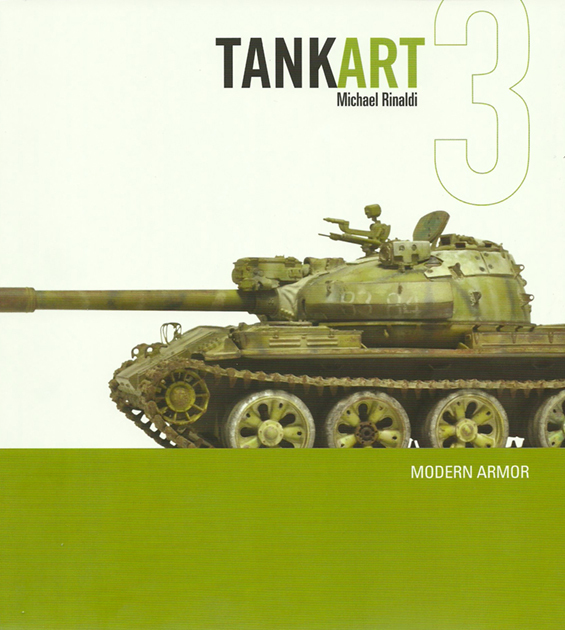 TankArt 3 by Michael Rinaldi is the third in a series of books dedicated to the author’s weathering techniques. Michael is a well-known and respected armor modeler who brings a designer’s background and skill set to his work and this third book reflects the evolution of his modeling philosophy and ongoing refinement of his techniques. Some will complain: “Okay, that’s nice but who cares? This is supposed to be a train blog and I ain’t interested in tanks.” That’s too bad because the military guys bring a lot to the modeling table in terms of materials and thought processes. Looking through the book you quickly realize there’s far more to rendering the impact of wear and tear on a painted surface than the diluted ink wash and drybrush crowd ever dreamed of. As modelers Michael and I share a remarkably similar approach to the craft. We both believe in the storytelling potential of individual models and in pursuing personal excellence for our work. We both also give a great deal of thought to how our internal dialogue influences the outcomes on the bench. In all his books, there is a strong emphasis on practicing techniques prior to attempting them on a valuable model. Additionally, the author categorically states that these techniques are difficult and require time to master. These simple truths and aspects of craft seldom receive the consideration they’re due and the way Michael wove them throughout the text elevates the book far above all other how-tos in my view. In contrast to the model train mentality of fast, dirt cheap and easy, this is a welcome breath of fresh air. So what’s the take-away for railroad modelers from a book like this? It’s the idea that the quality of the weathering and the final finish of a model starts at the raw plastic and/or primer stage of the build. It’s also, in my view, the depth of the presentation and the way the text speaks to the modeler as much as the modeling. With regard to the depth of the content, contained within the book’s 224 pages, there are six project chapters (five by Michael and one by guest author Andy Taylor), with each extending thirty pages or more in length. The chapters overflow with large format, well-lit and razor sharp photos that comprehensively illustrate the painting and weathering process of each build in a satisfying manner. In this format, Michael is able to walk you through each step in his procedure via the photos and extensive text callouts contained in orange boxes. The bulk of the chapter text and photo captions outline the how of a procedure, while the orange box callouts speak to issues of why this, why now? These provide an insight into the craftsman’s mind that the average how-to book sorely lacks. This is why I say the book speaks as much to the modeler as it does about the process. In addition to the individual build chapters, the book opens with sections outlining the author’s weathering philosophy and material choices. There is extensive coverage of his two cornerstone techniques of spraying a base undercoat of color, followed by a layer of hairspray, which is dried and then another paint layer that is chipped away with a moistened brush to reveal the base coat of color (known as hairspray chipping). Secondly, there is his use of oil paint rendering to alter and enhance a painted finish. Taken together, these two processes lend a depth and variety to finishes that are impossible to render by other means. Model railroaders are familiar with additive processes but not so familiar with subtractive ones like the hairspray technique. I’ve barely started to digest all that this book offers and I look forward to many sessions at my workbench of interpreting Michael’s techniques into railroad modeling applications. I’m excited by those possibilities and also a bit saddened that one has to go outside our craft to find such thorough and inspirational work. It speaks volumes to me about the current state of affairs. Is the book perfect? Not quite. The most significant stumbling block for me was the quality of the text. It would benefit greatly from a thorough and objective editing. Self-editing one’s writing is difficult under the best of circumstances (I speak from experience) and the book suffers here by forcing the reader to overlook a number of typos, the occasional incorrect word usage and other easy to miss slip-ups. Because such mistakes detract from an otherwise stunning piece of work, these comments should be considered as tough love from a fellow writer who understands the process and the desire for excellence. I purchased my copy directly from the Rinaldi Studio Press website and received excellent service. For other reviews of TankArt 3 with photos of the interior, you can go here and here. I didn’t include such shots in this review because the material is copyrighted and I didn’t have the author’s permission. To conclude, I make no apology for being a fan of this work and I get absolutely nothing in return for this write-up except the satisfaction of sharing a valuable resource you might benefit from. Sure sounds like an interesting book, Mike. I’ll go check out his website. Okay, looking at the site now. First of all, that’s beautiful and professional website. Talk about a nice presentation. Wow! (And I’m looking at it on using a depricated browser here at the office, I can only imagine how terrific it will look in the correct environment). I’m tempted by his book on Allied machines. I ain’t no tank modeller, but I am keen to see what’s in those covers. I can’t help but think that even if I learned nothing from the book it looks enjoyable just to flip through. One thing that impressed me the most is the thought he puts into his finishes. As I mentioned in the post, the painting and weathering starts at the bare plastic and primer stage, which reflects a key difference between the two crafts. Whereas we mainly start with pre-painted models and employ additive techniques (washes, drybrushing, dry pigments and such), the military modelers also employ subtractive techniques like the hairspray paint chipping process. These subtractive techniques require multiple layers of color and more pre-planning than we’re accustomed to but the results speak for themselves. Once we get past the provincial mindset of subject matter, these guys have a lot of know-how we could benefit from. Sign your comments Chris. My apologies for, again, forgetting to sign my posts. That’s a bad habit I need to break. Thanks for the reminder. Why am I such a stickler about this? It’s because forums, other blogs and the like are full of people hiding behind anonymous screen names who say things they’d never want attached to their real name. You folks are terrific in offering insights and discussions of real value and signing your name, even if you use it otherwise, keeps everybody honest all the time. It’s the only thing I really ask of people. Thanks everyone. I agree with the logic and quite like it. I’ve been scrolling backward through the blog archives and find it interesting that so far I haven’t seen any User ID’s that aren’t actually the person’s name. This is remarkable compared to the typical forum where it appears so many of us have an ID that isn’t our actual name – further underscoring the importance of the signature.